for schools, or the Surfrider Foundation Ocean Friendly Restaurants program. Get connected with the Plastic Pollution Coalition’s Plastic Free Schools, a global community of school and university campuses working to reduce their plastic footprint. The Community Environmental Council’s Rethink the Drink program is reducing the use of plastic water bottles by installing water refill stations at schools in California and Cafeteria Culture is reducing styrofoam and waste in New York lunchrooms with their SORT 2 SAVE Toolkit. Watch the Story of Bottled Water to learn why buying bottled water isn’t always the best choice. Host a screening of the movie Bag It and learn how to encourage your school or community to reduce the use of single-use plastic bags. Teachers can download lesson plans and attend an Ocean Plastic Pollution Teacher Summit at the Monterey Bay Aquarium. Students can check out the Algalita Marine Research Institute and their Plastic Ocean Pollution Solutions Youth Summit focusing on research and solutions. Get connected with Plastic Free July and take the pledge to reduce your plastic waste. Participate in a watershed cleanup near you and help to remove trash and document plastic debris impacting the world’s beaches and waterways. Join your local chapter of Surfrider Foundation or Waterkeeper Alliance, or form your own group of friends to clean up beaches and watersheds in your area. Register to volunteer for the annual Ocean Conservancy’s International Coastal Clean-Up Day which takes place each September, or participate in World Oceans Day events and celebrations on June 8th. Learn how the Bahamas Plastic Movement, Tangaroa Blue and Sustainable Coastlines are engaging volunteers and young people in the Bahamas, Australia, New Zealand, and Hawaii to collect data and remove plastic marine debris from the coastlines. Join the community identifying, geotagging and collecting the world’s litter by using the Litterati app when you clean your local watershed. – Make conscious purchasing decisions! Choose to be Plastic Free! Make the switch to reusable bags and bottles, say NO to plastic straws, and purchase products without microbeads or plastic packaging. Plastic can be incredibly useful in making durable items like contact lenses and electronics, but it is also used to make products used just once then thrown away, like straws, take-out utensils, and plastic cups. Plastic does not biodegrade, it photodegrades into smaller and smaller pieces and can remain in the environment indefinitely. When making purchases, you can make a choice to reduce your environmental impact. Join people around the world by taking action to turn the tide on ocean plastics with the UN Environment Clean Seas initiative. Seek out alternatives to the plastic items that you rely on. Choose to reuse when it comes to shopping bags and bottled water and bring your own reusable bags and beverage containers wherever you go. Choose products, such as facial cleansers and cosmetics, that don’t contain plastic microbeads. Make your own DIY facial scrub and take action with the 5 Gyres Microbead Action Kit. Say NO to plastic straws and take the One Less Straw Pledge, or encourage your favorite restaurant to go straw free with resources from The Last Plastic Straw. Support the #StrawlessOcean campaign and their goal of removing 500 million straws in 2017. As consumers, we all have the power to make conscious purchasing choices. Read the Plastics BAN List to learn about the most harmful plastic products and choose better alternatives. Take the 5 Gyres pledge to go #foamfree and avoid styrofoam products, or download the Action Guide to jumpstart a ban in your community. Refuse single-serving packaging, excess packaging, straws and other disposable plastics. Reduce everyday plastics such as sandwich bags by replacing them with reusable lunch containers. Bring your to-go mug to the coffee shop or smoothie shop to reduce lids and plastic cups. – Let your Voice be heard! Speak out for alternatives to single use plastics. Single-use plastic, such as the plastic used for water bottles, shopping bags, and packaging, is designed to be used for minutes or hours, yet can persist in the environment for hundreds of years. Plastic has been accumulating in the world's oceans since the 1950’s with studies showing marine litter is now 60-80% plastic. 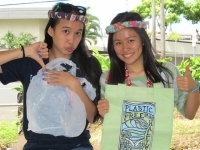 Help reduce waste in your town with Surfrider’s Rise Above Plastics Toolkit, a step by step guide to create positive change, establish bag bans or ordinances, and raise awareness about plastic pollution through education and outreach. Work with your local community to become a Bag It Town and systematically reduce the use of single-use disposable bags. Support the Plastic Soup Foundation’s Ocean Clean Wash campaign to find solutions to the release of synthetic microfibers into the world’s oceans. Watch the Story of Microfibers and join the call to action asking businesses to rethink their product design. Learn more about the Think Beyond Plastic Innovation Forum inspiring entrepreneurial projects with a focus on alternatives to disposal plastics. Support UPSTREAM and their efforts to promote Extended Producer Responsibility, and lend your voice to the #BreakFreeFromPlastic movement asking corporations to take responsibility for their packaging waste. Watch The Smog of the Sea and consider hosting a public or private screening to engage your friends, students or community. Check out resources for educators to dive deeper into the topic of plastic ocean pollution and solutions, including scientific lesson plans, art and creative writing activities, and sample student action projects. Community members or organizations can take action with links to online campaigns, toolkits, and community organizing strategies to reduce single-use plastic bags, water bottles, straws, styrofoam and more. You can also download a free screening kit filled with resources to host a successful event and engage your school or community in solutions to reduce plastic waste! Connect to the All At Once non-profit partners promoting plastic free initiatives.